B&M has announced a takeover of Heron Foods, a discount convenience retailer that operates 251 stores predominantly in the Midlands and North of England. The deal was done by B&M’s subsidiary, EV Retail Limited, for £152 million, including the debt assumed of the Heron group. An initial cash consideration of £112.1m was paid by B&M on exchange and completion of the acquisition today. Up to £12.8m of deferred cash consideration may become payable based on the EBITDA performance of the Heron group up to 31 March 2019; this is included in the £152m enterprise value figure. The initial cash consideration was satisfied from B&M’s existing cash resources and facilities. Heron, which reported revenues of £274.4 million and pre-tax profit of £8.6 million for 2016, offers 1,200 SKUs, including ambient and frozen food. It operates 251 stores, which boast an average 2,500sq ft of retail space compared to B&M's UK average of c.19,000sq ft. The acquisition will give B&M ready-made access to the convenience market, with the geographical location of Heron’s store network also a bonus, as B&M believes there is a great crossover in the two retailers' customer profile. 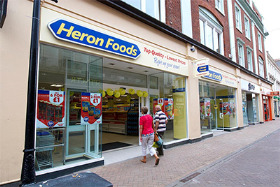 A number of Heron’s stores were refitted and refurbished during the course of the year and plans are already in place to grow the convenience retailer’s estate further, with the addition of between 10 and 20 new stores per year. Two of Heron’s owners Andrew David Heuck will remain in their existing trading and finance roles under B&M’s ownership, whilst Michael Heuck is retiring from the business, as planned. B&M said it plans to develop the business “alongside the existing Heron management team” and the retailer’s board has said that it expects to reap benefits immediately, with Heron having posted a like-for-like sales increase of 3% last year. B&M CEO Simon Arora commented: "B&M is already the UK's leading general merchandise discount retailer, serving four million shoppers per week. The addition of a complementary, proven discount convenience grocery brand to our own structural growth story gives the combined business an even longer, exciting growth runway. I look forward to working with David and Andrew Heuck and the Heron team to drive forward our shared ambition to deliver exceptional value for money to shoppers across the UK." David and Andrew Heuck commented: "We are delighted to be joining forces and working with B&M. Both companies share a vision to bring great value to customers and the combination of Heron's skills with the expertise and resources of B&M will mean the creation of a potent new force in the structurally growing convenience sector. Today’s transaction secures for Heron’s loyal and hardworking workforce a perfect long term home within the B&M Group and provides an exciting platform for the roll-out of more Heron stores nationally."